Before going any further, let me first state that I am one who keeps an open mind to the phenomenon of global warming. In fact, I am partial to the belief that global warming is taking place. That said, hypocrites and liberals (which often are one and the same) are not people I suffer gladly. Case in point, Al Gore's inconvenient truth. It is old news that Al Gore starred in the documentary, "An Inconvenient Truth," which touts the specter of global warming, its devastating consequences, and the need to reduce carbon emissions, reliance on energy, and energy consumption. That's all fine and dandy. Where I currently reside, the national average energy consumption per household is 739 kilowatt-hours (kWh) per month. At Santa Clara, the energy consumption of my household, with 3 students, 3 laptops, 2 desktops, was 504 kWh per month. 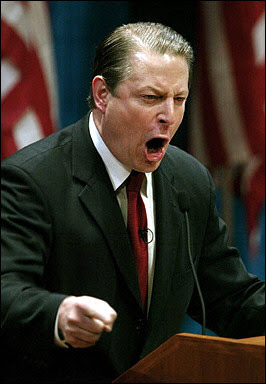 For 2005, the Gore household consumed a whopping 16,200 kWh per month. This astounding figure increased 13.67% for the year of 2006: a jaw-dropping 18,414 kWh per month. In 1 month, the Gores burn through almost as much energy as an average American household does in 2 years. What's he building in there? A Death Star? Public records reveal that as Gore lectures Americans on excessive consumption, he and his wife Tipper live in two properties: a 10,000-square-foot, 20-room, eight-bathroom home in Nashville, and a 4,000-square-foot home in Arlington, Va. (He also has a third home in Carthage, Tenn.) For someone rallying the planet to pursue a path of extreme personal sacrifice, Gore requires little from himself. Writing in The Atlantic Monthly in 2004, liberal writer Eric Alterman criticized producer Laurie David for her use of private Gulfstream jets. David, he wrote "reviles the owners of SUVs as terrorist enablers, yet gives herself a pass when it comes to chartering one of the most wasteful uses of fossil-based fuels imaginable." New Republic writer Gregg Easterbrook followed up, computing that "one cross-country flight in a Gulfstream is the same, in terms of Persian-Gulf dependence and greenhouse-gas emissions, as if she drove a Hummer for an entire year." Maybe Laurie David should change her activist website title from StopGlobalWarming.org to StopBeingAHypocrite.org? There's also Norman Lear, who insists that we, peons, cut down our driving, but has a 26-car garage to store all the vehicles he owns. And Barbra Streisand, with her fully-staffed mansion overlooking the Pacific Ocean, who advises her loyal fans to air dry their laundry outside. And Teresa Heinz and John Kerry, who warns us of dire environmental consequences if we do not cut back on our energy use, all while driving SUVs to their private planes to travel to their 5 mansions. There's Michael Moore, who, while filming "Fahrenheit 911," a so-called documentary that trashes defense and oil companies, also bought, held on, and traded in their stock. He once said that major defense contractor Halliburton was run by a bunch of "thugs," and suggested that for every American killed in the Iraq war, "I would like Halliburton to slay one mid-level executive." Publicly, Moore has claimed he wants no part of these companies and won't own stock. However, his IRS filings tell another story — Moore holds a portfolio which, among others, includes energy firms such as Sunoco, Noble Energy, Schlumberger, Williams Companies, Transocean Sedco Fore, and Anadarko; defense contractors such as Halliburton, General Electric, Honeywell, Boeing, and Loral. In fact, Moore sold off Halliburton for a 15 percent profit. Part of the profit was used to increase his stake in another defense company. Anyone remember the blatant hypocrisy of Rosie O'Donald? She's against private gun ownership but hires a gun-toting security guard to protect her and her household. Why? Because she's different — she's a celebrity. What is the liberal's creed, boys and girls? "Do as I say, and not as I do!" I'd much rather watch "Manbearpig." Check out some of the Left's reactions here. Compare Al Gore's home with another prominent politician's house.